Before they hatch, these lizards are tailored to whatever habitat they’re in « Nothing in Biology Makes Sense! Carlia longipes, looking right at home on a rock. Photo by berniedup. we’ll be adapted whatever the weather, whether you like it or not. Life is risky for a newly hatched lizard. You have to make your way in a habitat you’ve never seen before, full of all sorts of larger animals that think you’d make a decent snack, if maybe not a full meal. Wouldn’t it be nice if you could’ve been preparing for the conditions you’ll meet out there even before you crack through that shell? Well, for one species of skinks, it looks like this may be exactly what happens. A recent paper in The American Naturalist makes the case that rainbow skinks (Carlia longipes) develop in their eggs to match the habitat conditions around their nest—based on the temperature of the nest. 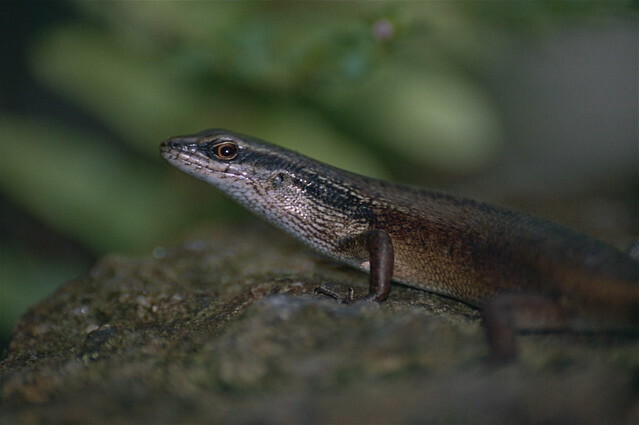 The paper’s authors, Brett Goodman, Lin Schwarzkopf, and Andrew K. Krockenberger, collected pregnant female skinks from a field site where forest met rocky outcrops. 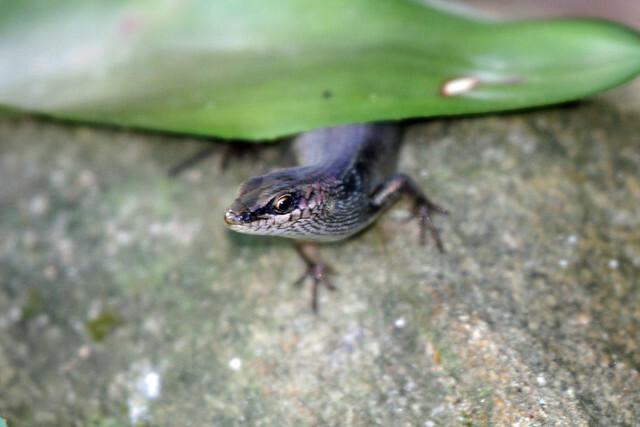 Skinks are found in both habitats, but the authors determined that skink nests in the leaf litter on the forest floor were, on average, about 5 degrees Celsius (9 degrees Fahrenheit) warmer than nests laid among the rocks. Back in the lab, the captured females laid clutches of two eggs apiece, and the authors randomly assigned one egg from each to an incubator set to match the warmer forest floor, and the other to an incubator set for rocky-outcrop cool. When the eggs hatched, Goodman et al. weighed and measured the baby skinks. Although they were all adorably teeny—just about two and a half centimeters long!—hatchlings from the cooler incubator were significantly bigger, with longer legs. Tests in a racetrack found that the cool-temp hatchlings ran faster and—when the racetrack was tilted up at a 70-degree angle, climbed faster than their warm-temp siblings. So the morphological differences seemed likely to translate into the kind of differences that would be useful for life on the rocks. What’s more, the hatchlings seemed to be aware, on some level, of what kind of habitat they were suited for. Goodman et al. put each of the hatchlings in enclosures containing equal areas of leaf litter and terra-cotta rocks, then filmed them over several hours. Although all the hatchlings roamed around both of the faux habitats, the cool-incubated hatchlings spent significantly more time on the fake rocks, and the warm-incubated hatchlings spent more time in the leaf litter. And they weren’t simply looking for a familiar temperature—the enclosures were kept in a climate-controlled room. The data presented by Goodman et al. look solid to me (I even downloaded it from Dryad to have a look for myself! ), but the authors don’t seem to have addressed what seems to me like a significant alternative explanation for the pattern they’ve found: Thermoregulation. Skinks are cold-blooded, and larger bodies might be able to hold their temperature a little longer in the cool conditions of a rocky habitat than smaller bodies would. Indeed, the cool-incubated hatchlings don’t just have longer legs; they’re bigger in general. Still, this is a nifty result, and certainly the foundation for a lot more interesting science in teasing out what, exactly, is going on with these skinks. Goodman BA, L Schwarzkopf, and AK Krockenberger. 2013. Phenotypic integration in response to incubation environment adaptively influences habitat choice in a tropical lizard. The American Naturalist 182(5):666-73. doi: 10.1086/673299. This entry was posted in ecology.